Authentication has become an integral piece of the identity management solution set, largely driven by the need to better protect user credentials and privileged accounts. More and more, industries with a focus on strong compliance regulations are seeing guidelines put in place that require stronger authentication techniques in order to protect that data. 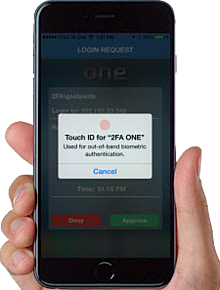 With nine authentication methods, 2FA offers one of the broadest, most well established solutions on the market. The combination of our IAM technology with 2FA’s multi-factor authentication enables Identity Automation to provide our customers with the most robust Identity and Access Management and authentication solutions in a single software stack. Support for nine different forms of authentication; including: RFID, smart cards, fingerprint biometrics, SMS, OTP, push-authentication, and more. Contact us or request a demo to learn more about these new capabilities.